Self-service password reset is a new service which allows you to reset your Bowdoin password if forget it or if an IT representative needed to reset it in the event of a phishing or hack attempt on your account. In order to use the service in the future, you will need to provide secondary contact information such as a secondary email account, a cell phone for text of call and/or a land-line (at least 2 of the options are required). 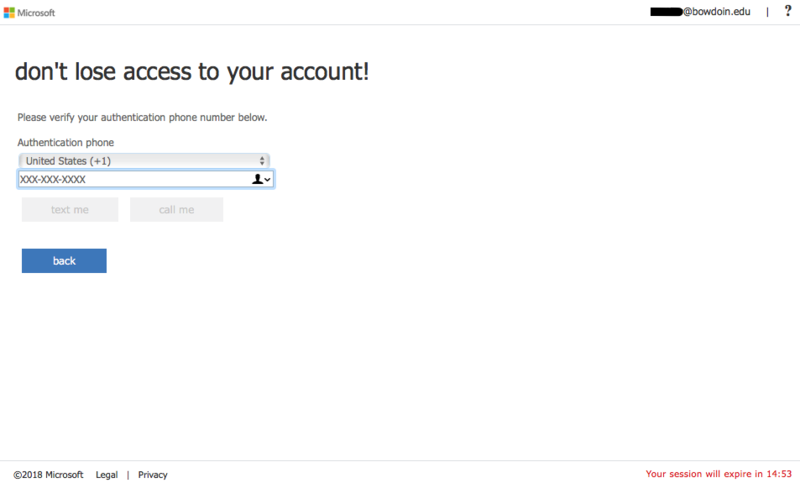 This guide will take you through the steps of setting up your self-service password reset settings. 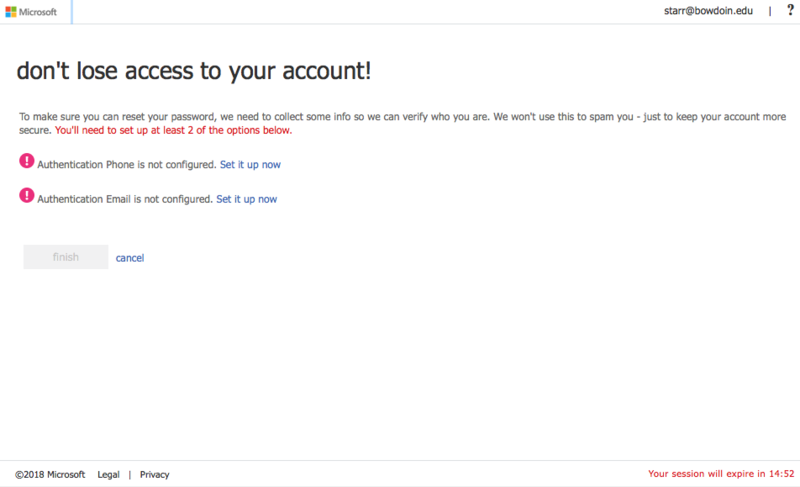 Because this process is currently in the pilot phase, you do need to be enrolled in self-service password reset first. To request being enrolled in the pilot program, see our pilot program enrollment request form. Firs-year students will be enrolled automatically. There is no need to request access to the pilot. All other students will be enrolled automatically in the fall of 2018 while faculty and staff will begin enrollment throughout the summer months. A secondary email address is highly recommended. Using your Bowdoin email address as a challenge answer may become an issue if your account password was reset by IT as you will not have access to that email account any longer. You will be asked to verify this information every 90 days. This is NOT a phishing attempt. You will be brought to similar screens as shown below to simply verify the information. Through that process you will be asked to enter a code sent to one of your secondary contact types (phone call, text or email). 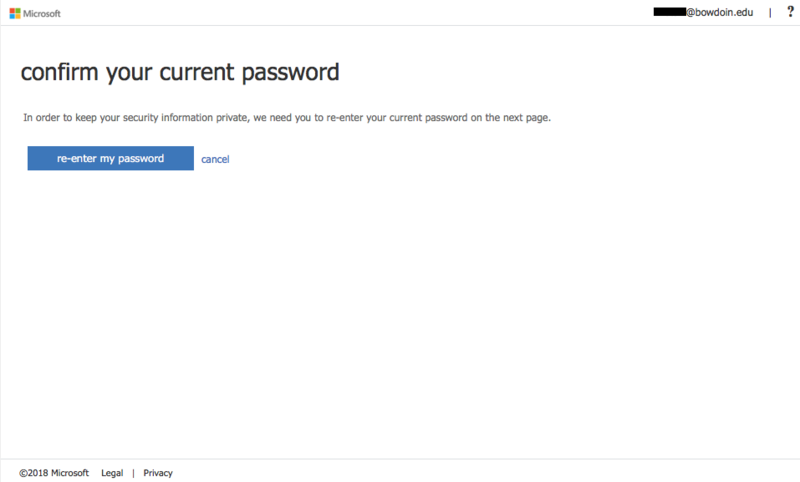 To reset your password, you will have to go to https://passwordreset.microsoftonline.com/ as the Bowdoin log in page does not allow the access to this reset form automatically. 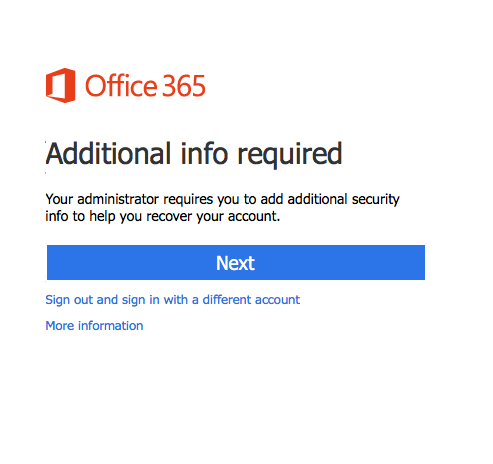 Once your account has been enrolled in self-service password reset, you will be asked to configure your settings the next time you log in to Office 365. When you log in, you will see the screen below. Click Next to continue with enrollment. You will be asked to re-enter your password. Click Re-enter Password to log in again. Fill out your mobile device number and click text me or call me which will turn become active once a valid number has been entered. You will be brought back to the "don't lose access to your account screen". Now click Set it up now next to "Authentication email is not configured", enter a valid, secondary email address and click email me. This should NOT be your Bowdoin email address. Remember, if your password was reset by IT, you won't have access to your Bowdoin email account in order to retrieve the code sent to you. Once complete, both secondary methods of authentication have been setup and you can click finish to be taken in to Office 365. Check out this knowledge base article I found in the Bowdoin College knowledge base. https://bowdoin.teamdynamix.com/TDClient/KB/ArticleDet?ID=46437 How to enroll in self-service password reset Self-service password reset is a new service which allows you to reset your Bowdoin password in the event that you have forgotten it or if an IT representative needed to reset it in the event of a phishing or hack attempt on your account. This guide will take you through the steps of setting up your self-service password reset settings.